The series has generated audiobooks, an ancillary album of “tragic” songs, a videogame, a board game, a card game and even a movie starring Jim Carrey and Meryl Streep. On Friday, January 13, Netflix released the first eight episodes of the latest iteration of Unfortunate Events—a series produced by and starring Neil Patrick Harris as the repulsive Count Olaf and Malina Weissman and Louis Hynes as the plucky but tragedy-haunted Baudelaire orphans. If you loved the books and waved your fists angrily at the movie (me too)—I am here to tell you that the series will likely make you feel way better about things. For those who do not know the books, the premise is simple: Three charming, resourceful and “reasonably attractive” orphaned children are marched from one horrible situation to the next in a part-absurdist, part-postmodern, slightly steampunk, semi-Gothic universe described by the bitter-despondent-hilarious Lemony Snicket, Handler’s pseudonym/avatar. There’s a mysterious secret society, and a nefarious (but happily, inept) villain who is after the orphans’ Enormous Fortune. Hijinks go on ahead and ensue. Look, adaptation is tough. Even translating a screenplay into a film is hard, and that’s the screenplay’s job. A novel isn’t using the same language as those things. It’s very specifically not supposed to proceed at the pace of a feature film, and vice versa, which is why truly faithful and also enjoyable adaptations of novels are bloody hard to pull off. So it was probably crazypants to think the story arc or even the spirit of a 13-book series could be captured in a conventional film – it’s like trying to put my 6’8” ex-father-in-law in economy class on a 737. You can shove and fold and scrunch, but no one’s going to be comfortable. The film “gets” the style of the books. But it’s torqued; it’s rushed; it makes narrative changes that don’t serve it. And while Jim Carrey has amusing moments in his turn as the odious Count Olaf? Dude, he’s playing Jim Carrey In Count Olaf’s Pants. Sure, the books have a strong absurdist streak, but there’s nothing absurd about expecting an actor to put some thought into interpreting a character. Sorry, there just isn’t. Actually, a lot of the performances are strikingly pallid considering the riches of the source material. Catherine O’Hara is a badass comedian and misses a lot of opportunities in her role as Justice Strauss. Meryl Streep frankly phones it in as Aunt Josephine. Timothy Spall, who is amazingly versatile, plays Mr. Poe, the dopey banker, in a way that makes the guy at my actual bank seem like a charisma-bomb. Olaf’s henchmen don’t do much effective, um, henching. And Jude Law is a strangely bland Snicket. (To be fair, Billy Connolly does a great job as Dr. Montgomery Montgomery.) In short, a rushed tour of plot points and anemic performances (other than Carrey’s, whose trademark mania is in full flow) culminate in Olaf being defeated but immediately released back into the wild, a conspiracy theory is hinted at but never elaborated upon enough to even justify its inclusion, and we close on the Baudelaire orphans being driven to their next, inevitably disastrous foster home sitchmo by the unbelievably clueless Mr. Poe. The first eight episodes of the Netflix series cover roughly the same amount of territory (The Bad Beginning, The Reptile Room, The Wide Window and The Miserable Mill). The series changes a few things from the books, but again, adaptation can demand this and this production team had the wisdom to attach Handler as a major scriptwriter. For example, fans of the books will notice that a reference to the VFD is made very early on. You will also notice a character (Mr. Poe’s secretary… or is she?) who isn’t in the books at all. Most importantly, you’ll end the second episode confused as to whether the Baudelaire parents are actually dead – but hang in there, deep breaths, it’s OK! Books are not movies. Books are not television episodes. Books are books, and when we translate them to the screen, a few things are bound to be added, subtracted, or tilted. Amazing opening sequence. The movie had a funny one – a stop-motion animation about a jolly little elf that dissolves to a misty graveyard and Jude Law’s voiceover lament that you are not, in fact, about to see anything remotely jolly. 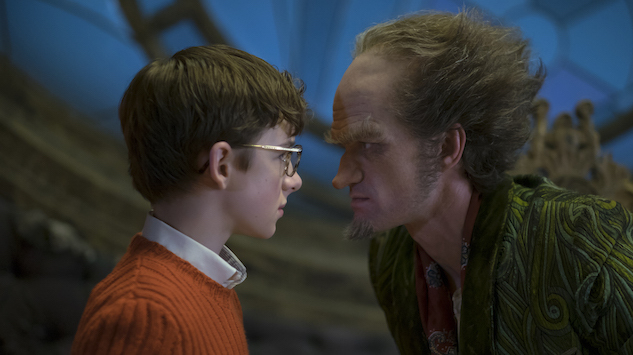 The Netflix series has a different take – a visually sumptuous sequence of images of Snicket’s “research” on the Baudelaires in sepia-tinted awesomeness, and a great opening song featuring Harris’ Count Olaf on vocals. Lushly crafted visual environment. The vibe of the series evokes Wes Anderson (and occasionally Tim Burton), and while the film version was visually strong, in this series there’s just more thought given to the details and more space to let them develop and sink in. Because we get eight episodes instead of a little shy of two hours, there’s more space for visual echoes and clues and a kind of coherence the film doesn’t quite manage. I will note that the last two episodes had significantly less of this visual impact, but in general, it’s just beautifully done. Patrick Warburton as Lemony Snicket gets to be Lemony Snicket. Two lines from the guy and you’re feeling a little sorry for Jude Law, imagining him gnashing his teeth and thinking “Man! I should have done that!” Warburton’s mysterious, morose and deadpan performance is partly his own genius, but it must be said that a huge percentage of the character’s success is that the medium allows him to spread his wings and use one of the series’ greatest assets, which is the sheer unabashed joy it takes in the intricacies of the English language. No adaptation of this work that made the linguistic acrobatics irrelevant to the story would be a true adaptation. The script nails it. Warburton nails the script. Thing of beauty. Overall brilliant casting and acting. Hey, in spite of what I said before about Jim Carrey, it’s not my least favorite role for him; many aspects of his performance were good. Neil Patrick Harris has subtlety (which here means “the ability to deliver a nuanced performance that doesn’t rely on incessant mugging”). He overacts when it makes sense (the character is a bad actor, so when Olaf’s “in character” it’s totally spot-on. When he’s Olaf as Olaf, he gives himself permission to be pretty dastardly, not just a hambone. Joan Cusack is a sheer delight as Justice Strauss, Alfre Woodard knocks it out of the park as Aunt Josephine, and K Todd Freeman is a hilarious and endearing Mr. Poe. Oh, and Catherine O’Hara 110% redeems her uninspired Justice Strauss performance from the movie, by appearing in the final two episodes as the evil hypnotist-optometrist who used to date Count Olaf. That’s for starters. Bottom line, NPH rules, and he has an embarrassment of riches to work with in terms of the supporting cast. Damned funny self-references. NPH frequently turns to camera and says things like “Why would you go to a movie when you can watch it from the comfort of your own home?” Given the absurdist bent of the books and the framing device of the character of Lemony Snicket, it’s just pitch-perfect. I defy you not to LOL. Pacing that makes sense. OK: not perfect; the second and fourth episodes in particular drag a little, though this viewer was too seduced by the script and the acting to be cranky about it. For people less easily snake-charmed by incredible wit and great screen chemistry, you’ll probably feel the urge to complain and I won’t say you’re wrong. On balance, though, this format lets the story’s full scope of style and complexity sing in a way a feature film never could have. Damn, can Daniel Handler turn a phrase. The series (book and screen) is a mystery, yes (Who torched the Baudelaires’ house and why? What the heck is the VFD? ), as well as an adventure (How many frying pan-to-fire leaps can these oddly resourceful children endure? Will Count Olaf succeed in doing away with them and stealing their fortune?). But it is also a paean to the power and beauty of well-crafted language (proper grammar even drives a major story point). The turn-to-camera grammar, syntax and vocabulary lessons are incredibly funny, but it’s worth noting that something deeper is actually going on here. Because the creator of the source material is an Olympian wordsmith, and because Netflix involved the creator of the source material heavily in the process of making the series, A Series of Unfortunate Events does something more than encourage you to care what happens to the protagonists or make you want to see the mystery unspool. It reminds us that words really do matter: Language is a character in its own right here, and that is remarkably powerful. One of the most common bummers about adapting on-page fiction to film or television is the degradation or loss of nuanced language that drives style, theme, vibe, feel, and if the writer’s any good, character development. These guys have managed not to let it happen, and I think it might be the greatest success of the adaptation. Well, that and Neil Patrick Harris’s monobrow.